Well, it’s The Doctor’s birthday – but are Trine-E and Zu-Zana gonna be impressed with his birthday suit . . . The season kicks off with a mix of some old and new. 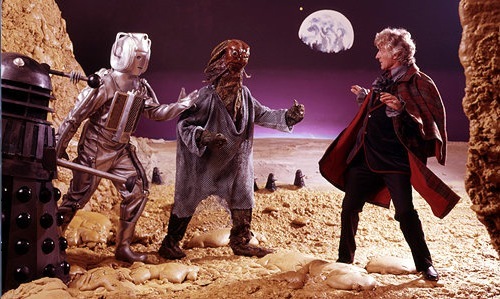 He wears the rust-red velvet smoking jacket (see below, top row) with a notched collar, black cord piping, with a triple frog-fastening that first appeared in The Curse Of Peladon the season before; a button-fronted frilly shirt, with large collar; for the first time a black velvet bow tie; and for a quick outdoor excursion, a new black Inverness Cape, this time lined with a sky blue silk (see below, bottom row). Another new story, and another complete change of wardrobe. This time he wears a new bottle-green smoking jacket (see below, top left), with a two-button fastening, large collar and lapels; a new green frilly shirt (see below, bottom left); a black silk cravat (as worn in his first season? ), though for one scene (and only one scene he is seen wearing a patterned silk cravat (see below, bottom right); and a another brand new Inverness Cape, this time in dark brown, with a burnt orange silk lining and four frog-fastenings (see below, top right). Following on from the last story, he continues to wear the same outfit of a bottle-green smoking jacket (see below, bottom left); a green frilly shirt (see below, bottom right); a black silk cravat ; and dark brown Inverness Cape with a burnt orange silk lining and with four frog-fastenings (see below, top left). 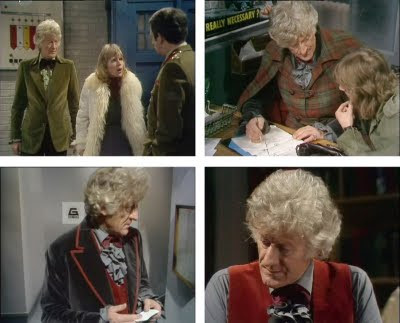 The story opens with (unusually for the Pertwee era) an overlap from the previous story, having him wearing the same costume (see below, top left). We then get the unprecedented opportunity to see him choose an new outfit on-screen (see below, top right)! 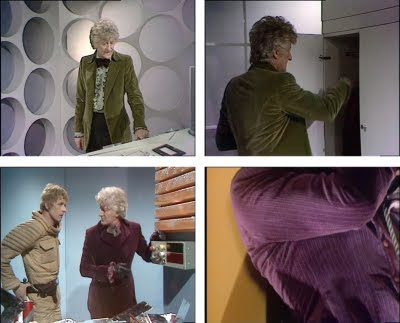 This time a brand new unusual purple herringbone textured (see detail below, bottom right) velvet double-breasted (the only double-breated he wears) smoking jacket (see below, bottom left); this is worn with a complimenting mauve frilly shirt; and dark purple trousers, the first other than black he has ever worn. the outfit is finished off with a purple silk cravat. This costume is never worn again. The season finishes with another episode of quick changes. 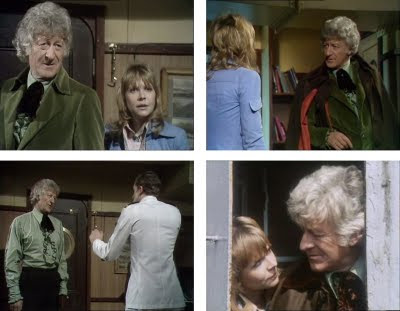 As with Terror of the Autons and Claws of Axos before, The Doctor opens wearing one smoking jacket (this time the bottle-green velvet number) (see below, top left). 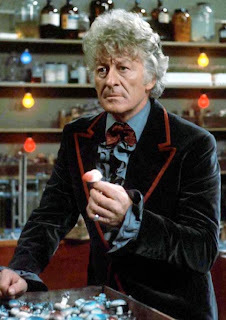 By the end of episode one he has changed to a brand new petrol-blue velvet smoking jacket with red-piped revered lapels; with a blue-grey frilled shirt; and a burgundy silk bow tie. 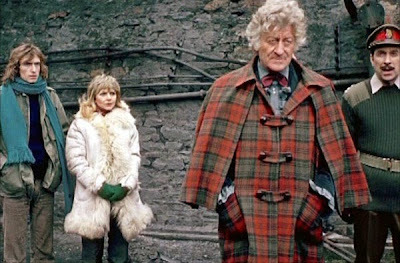 However, we don’t get to see this new jacket until episode four, as it is permanently covered from view by the red-green tartan Inverness Coat (first seen in The Curse Of Peladon), which is worn firmly buttoned up against the chilling South Wales weather (see below, top right). Later in the story we get to see another unusual sight: a waistcoat, in red velvet. 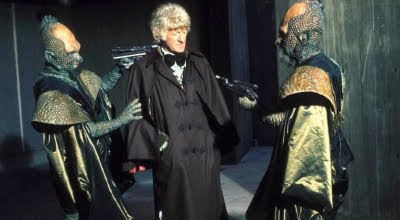 This is only the second waistcoat Jon Pertwee has worn, the first in The Curse Of Peladon. The least said about The Doctor dressing up as Ernie the Milkman (see below, left) and Misses Mop (see below, right) the better . . . . Which is sort of funny really, since he started out wearing his costume as a means of disguise to escape the hospital in the first episode of Spearhead From Space. Roger Delgado may have become The Master of Disguise (pardon the pun) in between by impersonating vicars (in The Daemons), Navy officers (in The Sea Devils), planetary ambassadors (in Colony in Space and Frontier in Space), but that was something The Doctor had never emulated, until now. It may be your birthday – but I thought we had got rid of those funeral capes! I saw you sneaking a cape in there for just one scene. Don’t think we didn’t notice. But we like that green number with complimenting shirt. Very dapper. The purple double-breasted? Such elegance! And a piped smoking jacket with waistcoat and bow tie to match the piping – some thoughts gone into that. Yes, but shame the thought went out of the window with the Old Mother Riley impression! What were you thinking! Right, where’s that TARDIS? We’re coming round! I really love this page. it's been such a help putting together my costume. I do have one question, it's been driving me crazy- on the rust colored jacket, where do you think the edge trim ends on the bottom edge? is it at the front corners or around the entire bottom edge too? If you look closely at the close-up scenes in The Three Doctors when the Second Doctor first arrives in the TARDIS, you can see that the bow tie is actually an exceptionally dark red/purple. I think "wine" is a good word to use. 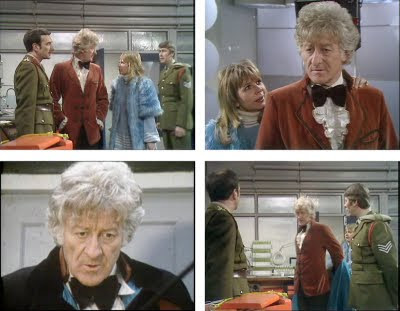 Best scene is when Pertwee is saying "Not so much one of them as one of us", or right before Troughton pulls Jo aside. 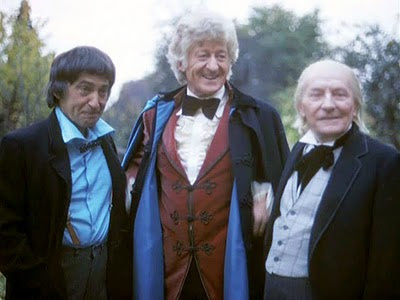 If you look closely at the Third Doctor's bow tie in The Three Doctors, you can see it's actually an exceptionally dark red/purple. I believe the word "wine" would be a good word to use. 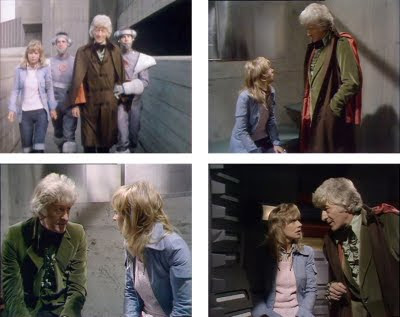 Best scene to see is right after the Second Doctor arrives in the TARDIS, when Pertwee is saying "One of me, to be precise" or when Troughton asks if Pertwee minds if he pulls Jo aside.